Sound recording and playback is really simple using the MediaRecorder and MediaPlayer classes .. see the example below .. 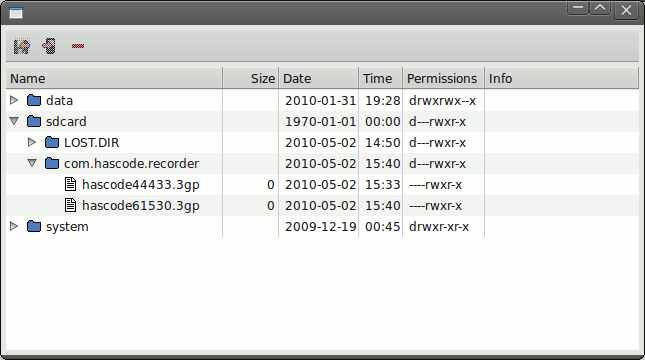 In general use the logcat tool from the Android Debugging Bridge to look for debugging messages, exceptions, strack traces ..
2015-03-03: Table of contents and image captions added. This entry was posted on Sunday, May 2nd, 2010 at 5:36 pm	and is filed under Android, Snippet. You can follow any responses to this entry through the RSS 2.0 feed. You can skip to the end and leave a response. Pinging is currently not allowed. I make use of your code for recording i’m getting the errors as below, pls help me how to solve this errors ..
10-04 11:40:52.407: DEBUG/voicerecorder(1255): start recording..
ur blog has been very helpful for me, but no where u have mentioned the code for the other part of ur interface(the dial button and arrow keys). And for the above error i think the fault might be of not setting the class path right(cause it differs frm windows or ubunto) or the package is in-approprate.. correct me if i m wrong.